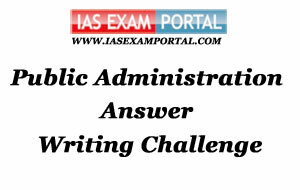 Weekly Mains Exam 2016 Answer Writing Challenge - Public Administration "MODULE- 41" | IAS EXAM PORTAL - India's Largest Community for UPSC Exam Aspirants. Weekly Mains Exam 2016 Answer Writing Challenge - Public Administration "MODULE- 41"
Public Administration- Paper I "Syllabus Topic - Administrative Behaviour : Process and techniques of decision-making"
A fact is a statement of reality indicating the existing deed , act or state of things. A value is an expression of preference.Most decision premises have both factual and value elements.To bring out the distinction between facts and values the means end distinction is used.Mixed issues of fact and value impinge on administration complicating the decision process. Simon asked for the necessity of being rational in making a decision, he defines rationality as one concerned with the selection of preferred behavior alternatives in terms of some system of values whereby the consequences of behavior can be evaluated. According to Simon, rationality is limited because of incompleteness of knowledge, lack of perfect anticipation and other psychological reasons, thus decisions cannot be solely fact based. Under these circumstances, the decision maker is not searching for the optimal decision but a satisfactory one. The “satisficing administrative man is thus different from the maximising economic man. Simon’s model of decision making is not free from blemishes. There are difficulties in measuring the costs and consequences of government action in many instances. In the practical world administration, the elaborate search process may not be feasible, as there is always demand for immediate action than cool contemplation. Indian Administration- Paper II "Syllabus Topic – Significant issues in Indian Administration : Disaster management"